The rand briefly strengthened against the greenback as it peaked at a session high of R14.35/$. The rand quickly relinquished these gains as the US dollar rebounded, which saw the rand retreat to trade 0.25% weaker at R14.43 at 17.00 CAT. Naspers [JSE:NPN] maintained its gains eventually ending the day 2.79% firmer at R3233.79. Steinhoff International [JSE:SNH] was one of the day’s biggest gainers as market participants reacted to the overview of the forensic investigation which was released on Friday after the close. The stock eventually closed 7.07% stronger at R1.97. Rand hedge British American Tobacco [JSE:BTI] advanced 2.78% to close at R599.00, while Sappi [JSE:SAP] managed to gain 3.98% as it closed at R72.90. Brait [JSE:BAT] was buoyant as climbed 5.28% to end the day at R25.90, while African Rainbow Minerals [JSE:AIL] closed at R4.90 after gaining 4.93%. Ascendis Health [JSE:ASC] came under pressure following the release of its half-year results which highlighted a decrease in headline earnings. The stock lost 4.66% to close at R4.50. 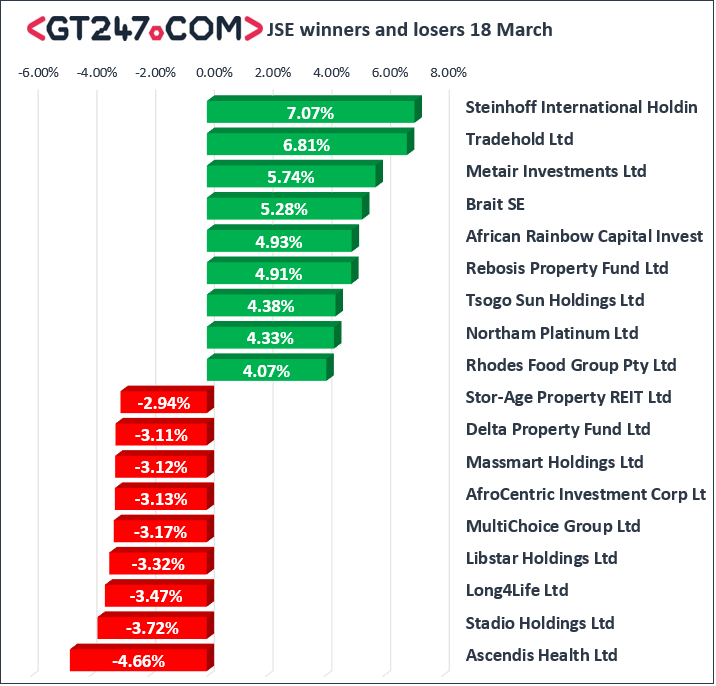 Stadio Holdings [JSE:SDO] fell 3.72% to end the day at R3.62, while Multichoice Group [JSE:MCG] dropped 3.17% as it closed at R120.83. Other stocks which came under pressure on the day include Massmart [JSE:MSM] which dropped 3.12% to R84.97, Libstar Holdings [JSE:LIB] closed 3.32% weaker at R8.16, and Resilient REIT [JSE:RES] lost 2.49% to close at R56.80. At 17.00 CAT, Gold was up 0.26% to trade at $1305.85/Oz, Platinum was 0.31% firmer at $834.38/Oz, and Palladium had rallied 1.64% to trade at $1578.39/Oz.